Esso is the brand used by ExxonMobil, derived from its previous name, Standard Oil. Esso filling stations allow customers to gain Tesco Clubcard points when they fill up with fuel or purchase a shop item. This is soon going to be replaced by Nectar. They are known for advertising campaigns including "Bom, Bom, Esso Blue" and "put a tiger in your tank". Evidence of tiger-branding can still be found at some of their garages. 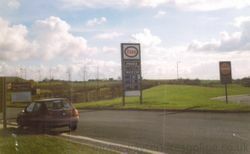 Esso ceased trading in Northern Ireland, with many garages becoming Maxol. In the Republic, many Esso garages became Topaz. In the early 1960s, Esso had refused to become the operator of any motorway service areas. They then put in a surprise ambitious bid for Heston, which was rejected on the assumption they weren't really interested. Esso went on to operate several whole motorway service areas under the name Taverna, gaining their first one by chance. In the 1990s, after Taverna had quit the industry, service stations were de-regulated. With a new-found interest, Esso unsuccessfully applied to build services at Longbridge, Lower Kingswood, Meon and Swinford. 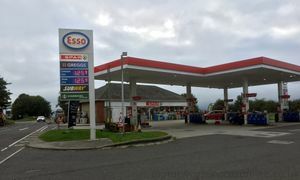 In 1998, Mobil merged with Esso to form ExxonMobil. Until then, Mobil could be found at some services, and in the 1970s they were an operator. An On the Run shop. Like the other major forecourt operators, Esso owned and operated several filling stations, which were all sold off by the Autumn of 2015. These 450 stations were operated under the name ROC. ROC garages were sold to Euro Garages, MRH and Rontec. The stores were previously branded as either On the Run or Snack and Shop. On the Run, which was the branding for the larger stores, usually included a Costa and a seating area. Snack and Shop was the branding for the smaller stores, and each store was essentially a kiosk which sold a few necessities and either Kenco, Coffee Nation or Costa Express. Blyth (A1(M)) - former Snack and Shop, now operated by Euro Garages. Cardiff West (M4) - former On the Run, now operated by Rontec. Cherwell Valley (M40) - former Snack and Shop, now operated by Euro Garages. Ferrybridge (M62) - former Snack and Shop, now operated by Moto. Frankley (M5) - former Snack and Shop, now operated by Moto. Magor (M4) - former On the Run, now operated by Rontec. Maidstone (M20) - former Snack and Shop, now operated by MFG. Rownhams (M27) - former Snack and Shop, now operated by BP. 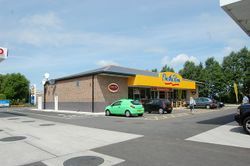 Sandbach (M6) - former Snack and Shop, then operated by Roadchef and now operated by BP. Stafford (South) (M6) - former Snack and Shop, now operated by Euro Garages. Tamworth (M42) - former Snack and Shop, now operated by Euro Garages. Trowell (M1) - former Snack and Shop, now operated by Moto. An Esso 'price watch'/tiger sign.